With over 60 years of experience in manufacturing and selling material loading equipment, Copperloy has established a reputation in providing quality equipment that’s built to last. At Copperloy, we offer our customers the option of tailor-made equipment that can handle any unique challenge. When it comes to our edge of dock levelers, this equipment provides our customers with a practical solution for loading and unloading trucks from most dock positions. Copperloy is the most trusted name when searching for an easy-to-operate edge of dock leveler. Why? It’s because we offer market-leading equipment parts, coupled with superior safety. Our levelers easily mount to the face of nearly any dock. And if that’s not enough, we also offer transition plates and approach ramps to further take the weight off your shoulders. 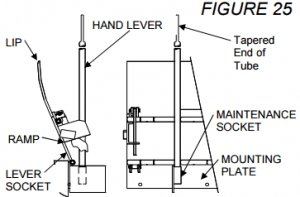 At Copperloy, we offer a manual edge of dock leveler with the option of having a hydraulic power unit installed to it via a wall-mounted push button. 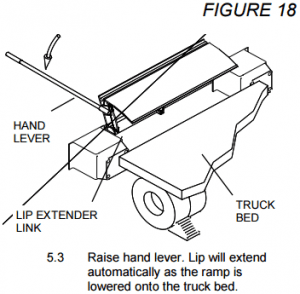 That push of a button allows the unit to lift and rest heavy items, from 20,000 to 30,000 pounds, to the height of a trailer bed for safe freight handling. Safety is the top priority at Copperloy. That’s why each of our edge of dock levelers are equipped with a safety maintenance strut to secure the unit, while performing routine maintenance. Speaking of maintenance, lubricating the hinges is simple on our levelers because they come with grease fittings. Our edge of dock leveler has been designed and engineered using a three dimensional software package. Copperloy’s exclusive lift mechanism and spring assembly sets the board in place with a fraction of the effort needed to operate a conventional edge of dock leveler. Another area of importance at Copperloy is the quality of our leveler’s bumpers. The rubber/steel block bumper combo is often times the first thing to go bad in an edge of dock leveler. Several years ago, Copperloy began using a specially-blended rubber formula bumper that is 3,000 PSI. We truly believe this is the longest lasting – and absolute best option – on the market. Durability is another key component to a properly functioning and lasting edge of dock leveler. While most edge of dock levelers have some wear and tear at the pivot points, Copperloy’s pivot points are equipped with bushings to minimize wear. This is another area that sets us apart from our competition. An edge of deck leveler isn’t the only piece of equipment offered at Copperloy. We provide customers with a wide variety of American made mobile yard ramps, dock-to-ground ramps, truck ramps, and forklift ramps. We also have rail boards, dock plates, and portable platforms. All of our material handling equipment is available to purchase, some even available to rent. Copperloy provides only the best products on the market to make our customer’s loading and unloading experience significantly lighter. Learn more about what Copperloy can do for your unique dock and ramp needs by calling us today at 1­800­321­4968 or contact us by clicking here. EOD bridging the gap between a truck and a loading dock. 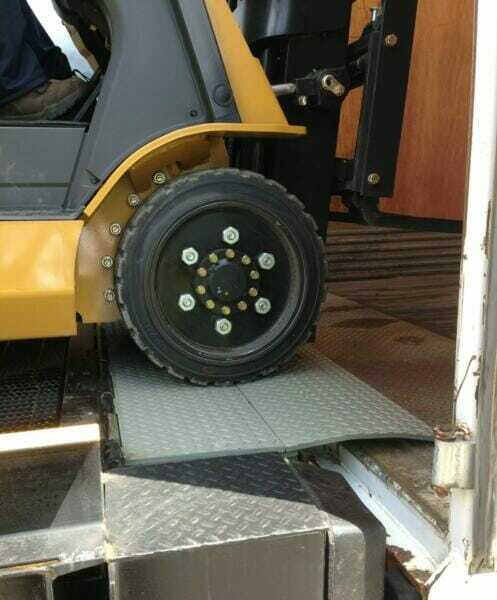 This is perfect for forklifts. Copperloy is happy to announce that we will be attending the upcoming TPE in Captiva, Florida. The Terminal Properties Exchange will be taking place this year from May 12-15, and is one of the largest annual events of its kind for the freight industry. As a leading provider of material handling and loading dock equipment to the industry, we will be showcasing a variety of our versatile and innovative solutions at the TPE. We have been serving the logistics and freight industries for more than 60 years, providing a wide range of products and solutions. Everything we produce is proudly made in the USA, and with an expert in-house team of engineers, we can custom design and manufacture tailor-made solutions for companies with varying needs and unique or hard to match specifications and circumstances. With the US economy being so reliant on the logistics and freight industries, just about anything which is purchased across the country spent some time on a truck, and that means that a Copperloy product helped along the way. Through our decades of experience, we understand the challenges of the freight industry. This firsthand knowledge is one of the many reasons that leading freight carriers and brands continue to work exclusively with us. Of course, anyone who has been in this or similar fields before knows that one of the major hassles of logistics and freight are the inconsistent measurements and specifications of different trucks and other gear and equipment, and the burden this places on freight terminals and their employees. And this is exactly where and how our products come to the rescue. We’re a leading provider of edge of dock levelers, providing a service range of 5 inches above and 5 inches below the dock, offering amazing flexibility. Our edge of dock levelers are offered with various gross weight capacities, and in all common sizes and specifications, and offer quick and easy operation with the dual extension spring lift assist. They are built to last, require little to no maintenance, and can be equipped with push button operation and hydraulic lift functionality. We also provide a huge range of dock ramps, including dock to ground ramps, and portable yard ramps that help facilities maximize their space and efficiency. In addition, Copperloy also produces a wide range of other material handling equipment. This includes dock boards, dock plates, dock lifts and lift tables, portable platforms, and on down the line. We’ll be happy to provide you with more information and product specifications and capabilities while we’re at the TPE in Florida! If you can’t make it to TPE, then contact us now for information about our products and how they can help your transportation company. The Terminal Properties Exchange is a great opportunity to connect with potential service and equipment providers, and others across the logistics and freight industry. If you or your company will be attending the TPE this year, be sure to stop by and see what we’re able to offer.